The successful introduction of the Black Panther to Marvel's lineup has led to the Marvel Black Panther comic becoming one of the most successful titles so far this year of all comics. I'm back with yet another review for Marvel's Black Panther superhero character that has had an impressive introduction into the Marvel Cinematic Universe. If you haven't been following along, I suggest you read my reviews for Issue #1 and Issue #2 first. Tetu seen here going through the motions of a ritualistic, ceremonial dance as the voice of a spirit echoes throughout him. A glyph burns with a green essence beneath his feet. We begin this issue with Tetu as he goes through a meditative ritualisticsequences in the Alkama Fields. Ta-Nehesi Coates places the voice of the spirit of the Earth into Tetu as he moves step-by-step through his dance. The "Earth spirit" (for the lack of a better term since this entity has yet to be identified) recalls all of the moments of pain and destruction in Wakandan history. Namor's flood, Dr. Doom's invasion...everything. Tetu in many ways is serving as a conduit to a powerful energy that feels that it is time for "the flesh" to be put into its place. We get a glimpse of Tetu's connection with higher dimensions as a glyph appears under his feet as he dances ceremoniously. Tetu clearly sees himself as a freedom fighter against the Black Panther and so far this has been a totally unique interpretation of the Marvel Black Panther character. The extent of his power has yet to be seen. Whether or not he poses a serious threat to T'Challa remains to be seen. T'Challa is incredibly powerful and capable, but he is losing control of Wakanda due to past events. The Marvel Black Panther Movie Has to Include Birnin Zana! Birnin Zana represents the splendor and excellence that is Wakanda. It is the seat of power of the Black Panther. Elsewhere in Birnin Zana, the Capitol of Wakanda, T'Challa speaks with the Queen Mother in a way he would never speak publicly to anyone else. He talks about how he is engulfed by his recent defeats, how he keeps seeing ancestors and visions of his sister (and former Black Panther and Queen) Shuri. The Queen Mother tries to lift the weight from off his shoulders with kind words, but it doesn't appear effective. The Queen Mother states that she believes T'Challa is stronger than all the Kings to rule Wakanda before him. She states that previous Kings could never have imagined fighting against the enemies that T'Challa has (this is true). She states that the problem is not his blindness, but his clarity. The Queen Mother says that it is the soul of his Shuri that should concern him. On the last panel we see Shuri's body hanging in stasis, an image that has been consistent thus far in this new Coates run. I anticipate seeing how this will play out. Aneka and Ayo plot to take their insurrection to a whole new level by forming an army! Of all the subplots, the one involving the Midnight Angels (formerly the Dora Milaje) is the most intriguing to me. We see the two women in Northern Wakanda after having laid waste to more corrupt Wakandan Chiefs who have tried to fill the vacuum of power in the midst of total political chaos. A older woman crawls from under the rubble of a fallen building and asks sadly "where are the champions of Wakanda? Where is our country? Where is The Panther?" Aneka and Ayo get into a discussion and Aneka states that they've proven they can bring down the hammer of vengeance onto the corrupt, but can they protect the innocent? Ayo states that they are not an Army, in which Aneka responds that they will become one. We now have two rebel forces developing in and around Wakanda. One led by Tetu and Zenzi and the other by the Midnight Angels. The deck is truly stacked against T'Challa in this one! Marvel's Black Panther comic has been gifted with the most beautiful artwork by Brian Stelfreeze. Make no mistake, there is much mysticism and "magic" in Black Panther too! 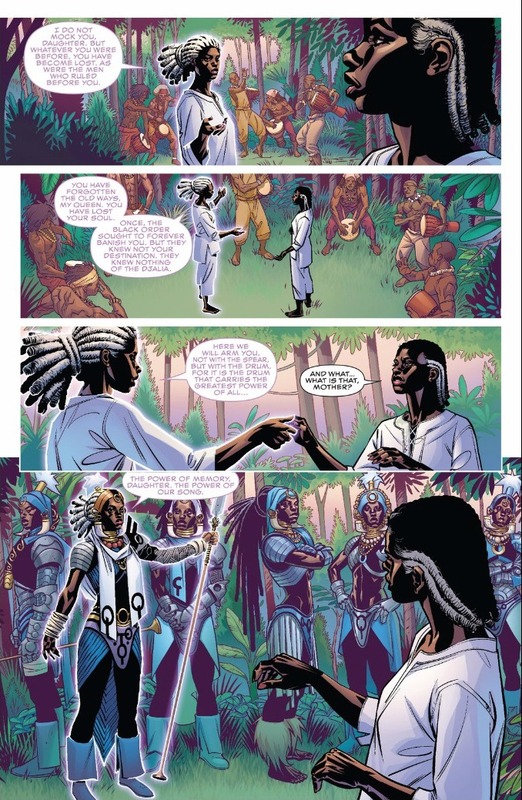 The elderly woman that has been speaking to and guiding the soul of Shuri finally reveals herself to be the Griot of the Djalia. She is the caretaker of all Wakandan history that has been lost to who she deems the "prophets of the Metal Age." The griot states that she is not her actual Queen Mother, no, she is in fact a compilation of all of them! She explains that when The Black Order banished her from the physical plane, they knew not where her soul would end up. They knew not of the Djalia where the Griot states she will be armed, but not with "the spear," but with "the drum." Shuri asks what "the drum" is which is a logical question. Of course however a straight-forward answer won't come yet. The Griot states that the drum is the power of memory, the power of their song. I would say this is my second favorite subplot, only because I don't yet know where it is going and it is unclear whether or not Shuri will return to the physical plane and somehow be brought back to life. It seems likely that she will however. I don't think they'd be dedicating a subplot to a woman that is going to have no impact on future events. The Hatut Zeraze make their first appearance in this issue in combat form. Herein lies the climax of Issue #3, the "showdown" between T'Challa and Tetu/Zenzi. It isn't so much a fight with regards to Zenzi, who is easily pushed against a tree by the Black Panther and knocked unconscious after the Panther disposes of a handful of armed militia soldiers. As the fighting goes on, there is an internal dialogue that T'Challa is going through that is common in comic books. T'Challa says he is blind to his own blood, as in the people of Wakanda who he is attacking. He thinks to himself that his country is dying in front of him. Suddenly as Zenzi lies motionless on the ground, the Black Panther calls out the Hatut Zeraze, the 'special forces of Wakanda' if you will. They help dispatch of the remaining rebel militia soldiers, however no one is paying attention to Tetu. We see Tetu pouring some concoction over his face turning his face white. He spreads warpaint across his eyes and lips and somehow commands the Earth to come to life around him. Huge tree vines entrap the Hatut Zeraze and the Black Panther! Now we see the power of his connection with the spirit of the Earth. Tetu accuses T'Challa with plotting against Wakanda due to his coming to terms with Namor during the events of the Secret Wars storyline in an effort to save humanity. Tetu says that the day is coming that Wakanda will be ruled by Wakandans and that the era of Kings will come to an end. The last we see of Tetu in this issue is him carrying a still unconscious Zenzi in his arms away from the group of strangled fighters. His power is interesting to say the least and I can't wait to see the extent of his power. Aneka and Ayo, the Midnight Angels, are forming an army. Yea...no one would want to mess with them right now. They are wearing some of the best armor in all of Wakanda and arguably the world. We end this issue with my favorite subplot. The rallying of the amazonian women of Wakanda is underway and they have finally come face-to-face with Lord Mandla who wears a robotic gorilla armor suit. This is set up for what will surely be a very confrontational Issue #4. I'm loving the new Marvel Black Panther comic run. The Black Panther superhero has always been one of my favorites and Ta-Nehesi Coates has become a writer I've come to admire and respect over the past couple years. Follow Black and Intellectual on Facebook, Twitter, Instagram and Pinterest by clicking the links below if you want to see more content like this!